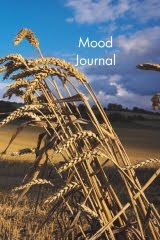 Since the release of the 2010 Daily Mood Organizer, I got to thinking that perhaps the MOOD JOURNAL could use a small make over. The old book cover seemed a little drab - it was totally black with white letters. So a a few weeks ago I went to work on creating a new cover for this journal, and this is what I came up with. The wheat blowing in the wind reminded me how sometimes our moods can shift the same way, north, south, east, west, and the open blue sky seemed inviting above the open field. But that's just my perspective.